Whether you’ve dealt with a lifetime of chronic aches and pains or suffer from a specific ailment, when you’re in constant pain, relief is the only thing on your mind. Are you using the same over-the-counter painkiller to treat everything from toothaches to knee pain? If so, you may only be providing a temporary mask to your suffering- not healing it- and it’s only a matter of time before the pain returns. Every pain is unique, from headaches to back strains to arthritis and there’s no one-solution-fits-all to alleviate your suffering. Natural remedies expert Letha Hadady knows that to treat pain you must focus on the cause. Organizing her advice by both symptom and type of pain, Hadady guides you on how to use a variety of all-natural herbs, extracts and pills to ease and control the source of your suffering. I’ve been in daily pain since December 11, 2005. I basically just woke up with it and to this day, I am not entirely sure what caused it (although I do have my theories). It’s been SO HARD. Chronic pain really affects every aspect of my life. I’m not the same person I was 7 years ago and there’s many things that I’m unable to do now. I’m always reading books on my condition and ways to help put a dent in my pain. That’s the main reason why I accepted Naturally Pain Free by Letha Hadady for review. I like that this book focuses on natural treatments since they are more readily available vs. prescription medication. I don’t have a family doctor where I live in Nova Scotia because of the state of the Canadian health care system (but THAT is a whole other post!). At least with natural treatments, I have some control. The book is broken up into three sections. The first section focuses on Pain Prevention and Care and lists the ways to combat a number of common ailments like headaches, backaches and arthritis. I headed right to the Female Issues chapter since that is the one that was the most applicable to me. I noticed that the author talks a lot about traditional Chinese medicine in the treatments. I took a few courses in TCM & Acupuncture a few years ago so I’m familiar with looking at my tongue to find out what’s going on and the various TCM organs. She talks about period pain, menopause and yeast infections. There was no mention of vulvodynia though which is what I wanted to see. The second section is about healing pain quickly and painlessly like sports injuries, skin issues, computer-related injuries and toothaches. My shoulders and neck often get sore from sitting too long. The author recommends a simple tea made of turmeric and cinnamon to help get the circulation going again. Part three is about how to have a pain free lifestyle and has chapters about emotional trauma, chest pains, nerves and tonics. My pain is both nerve and muscle related so I went straight to the nerve pain chapter. Right away she tells you what you should avoid if you have nerve pain and the first one was coffee! I drink a lot of that and didn’t realize it could be aggravating my pain. Unfortunately my condition wasn’t mentioned in the book, but I do feel like I learned something by reading it. It actually prompted me to make an appointment to see a Naturopathic Doctor this week! Thanks for sharing this! It’s so easy to just take medicine when something hurts – I don’t usually look deeper to see what may be causing it. Thanks! 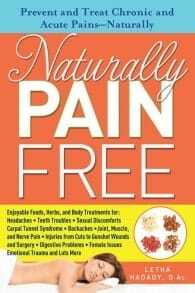 Naturally Pain Free: Prevent and Treat Chronic and Acute Pains-Naturally By Letha Hadady. I Hope You Find Out What’s Causing Your Pain And Get Well Soon. Thanks for you review. This looks like a great book, I love using natural remedies opposed to prescription drugs. I want to get this book and read it! I am too in chronic pain every day! My back is so damaged from a botched surgery that I had at 12 years old. My back hurts every day! I have to live with pain every day, and it does make me feel depressed sometimes. My sister helps me out a lot, and I do not know where I would be if she was not helping me! But I like that this book uses Natural pain free ways to help with chronic pain! I’m sorry that you’re in chronic pain…I really hope the book or the naturopathic doctor helps you find a way to eliminate (or at least relieve) the pain. The book looks like a great read…I like that it not only has information on treating, but also on preventing chronic pain….I feel like that is a key element missing in our modern day medical system. Thanks for the review! I have had significant pain relief (back and neck) with acupuncture after being involved in a car accident 2 years ago. I got more pain relief from acupuncture in a few sessions than I got from physical therapy, prescription pain medicine and muscle relaxers. There are many natural/alternative medicine treatments available for chronic pain – you just have to find what works for your type of pain. Thank you for your review. I too live with chronic pain. I don’t remember what it’s like to not have pain. I need to look into this book. Anything is worth a try!! I’d love to get this book. I’ve been living in pain since 1999 when I hurt back at work. It’s got worse in the last 2 yrs and I know what it is. It’s multiple back issues that requires surgery which I’m alittle worried about someone cutting into my back. I have neuropathy which is from my daubetes and chemo I had last yr. Thank you for the review, I’m putting this book on my amazon wish list, both me and hubby are in constant pain from prior injuries, though a chiropractor has helped both of us it always returns and we can’t afford the care on a regular basis. I’d love to learn how to manage it at home. Thanks, I’ll look for this next time we go to the bookstore! I’m sorry to hear about your chronic pain. My daughter was very sick recently and even though she is a lot better now, she still has very painful times. We know about chiropractic and acupuncture in helping in many things. Also, spices can help with inflammation and arthritis. This sounds like the book is informative and laid out well. I hope you find something to help. I should look for this book for my spouse he has severe chronic pain and there’s nothing that has helped yet.